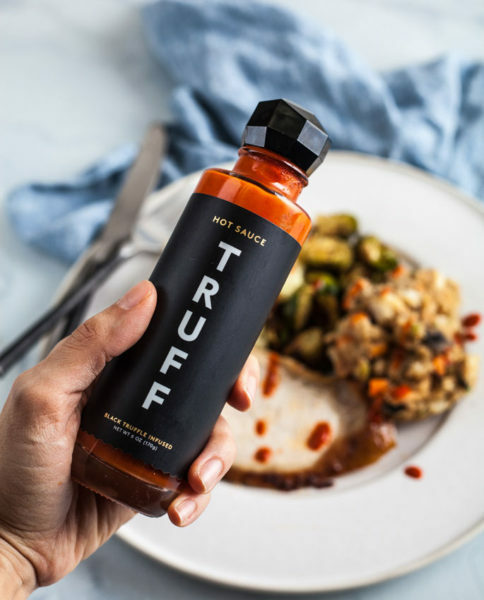 Food 4 Thought – Issue 3 – TRUFF Hot Sauce | Blog | Di Bruno Bros.
At what point does trend reach critical mass? Is it always as easy to spot as using chicken cutlet as a taco shell? How many pastry hybrids do we need to try before we go back to appreciating a great bagel? Cronuts, Cragels, Brookies, Duffins, Bruffins, Crozels…can I just have a perfect croissant, please? Of course, your enthusiasm for trends depends on where you rank on the scale from Ron Swanson to Kylie Jenner. But at Di Bruno Bros., we don’t judge. After all, we’re kind of obsessed with a trend of our own: the unrelenting flow of new condiments with truffles in them. When does it stop? Will it stop? Do we even want it to stop? I’ve been around long enough to remember when truffle honey first hit the market. At the time, the concept of trufflizing everything had just begun, so it was met with piqued curiosity. “Earthy truffles crossed with sweet honey? What would I put that on?” Everything, it turns out. You can put it on everything. 3) Recalling that truffles make everything better. I should have known better than to test this tried and true process, but I found myself starting over at the beginning last week. At first, I was incredulous. “For what? When you want to make elegant nachos?” The bottle was too smartly designed: bold, vertical font, stark, eye-catching color contrasts, a cap that looks like a cubist’s black truffle. But what kind of culinary pioneer would I be if I didn’t at least try it. When I unscrewed the cap, the aroma of black truffles reminded me to chill. I was about to experience truffles. How bad could life be? Still, I brought the first spoonful to my lips wanting to not like it. Moving on to step 4, I now feel about TRUFF the way Ethel feels about Frank’s Red Hot. There’s nothing it can’t do. 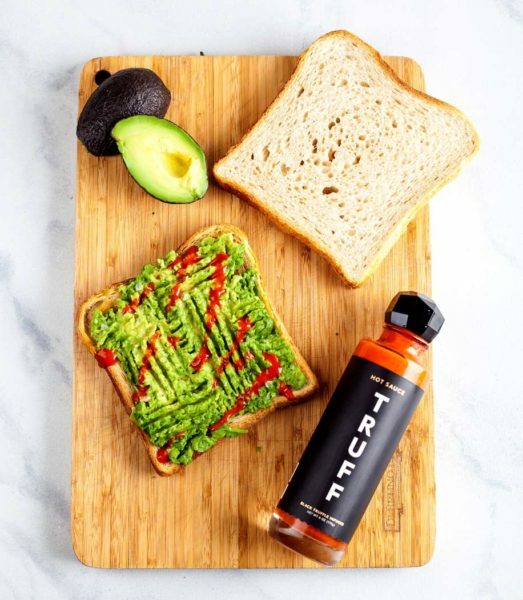 TRUFF is a blend of chili peppers, organic agave nectar, black truffle oil and savory spices. They come together in a surprising harmony that is at once powerful yet elegant. It’s spicy – no more so than Sriracha – but balanced with sweetness (agave) and earthiness (truffle). These nuances make it compatible with many foods. We often don’t know what we need until we see it for the first time. I know I had never “wanted” this product before hearing of it, but as Henry Ford said, “If I had asked people what they wanted, they would have said faster horses.” A good reminder to keep an open mind. TRUFF strikes the perfect balance between pour-it-on bar condiment and delicately-drizzled touch of luxury. 1. Classic French scrambled eggs, gently whipped into an ethereal texture, with just a spoonful of TRUFF. 2. Baked Potatoes, loaded up with sour cream, bacon bits and a generous dose of hot sauce. 3. Nachos. Seriously. Make sure to add some between each layer of chips as you build. 4. Avocado toast. Build to your discretion, and drizzle with this. 5. Leftovers! Inevitably, you need to stare down that turkey in the fridge and bring it back to life by way of sandwich, wrap, or a masterpiece buried in the depths of your hypothalamus. TRUFF is, quite literally, that special sauce that brings it all together. Editor’s note: Around here we treasure Hunter’s favorite things as much as any throughout the known culinary universe. 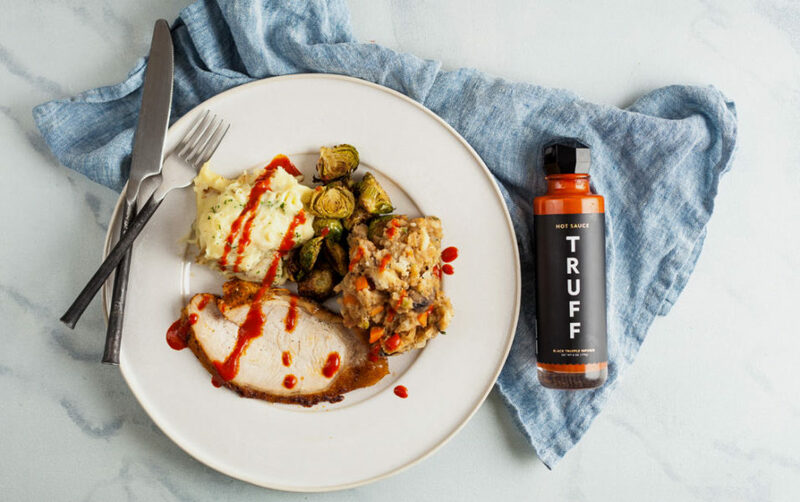 But it’s worth noting that Oprah has caught on as well, selecting TRUFF Hot Sauce as one of her “Favorite Things“! Di Bruno White Truffle Cream: A smooth and creamy puree, ideal for spreading on crostini for appetizers or mixing into a risotto. Sabatino Truffle Zest: this truffle seasoning is a great finishing spice for any dish, including pasta, pizza, salads, eggs and potatoes. Di Bruno White Truffle Honey: our best-selling condiment, this aromatic honey is perfectly balanced by earthy truffles. Delicious on cheese. Moliterno al Tartufo: A pecorino from Sardinia flush with shaved black truffles. As stunning to taste as it is to look at! Hi, Hot truffle sauce = look forward to trying! We have a number of truffle-infused products, from zest to oil and beyond. See this link or the end of the blog post for more items. I tend not to like heat…yet, I am inspired to be adventurous!